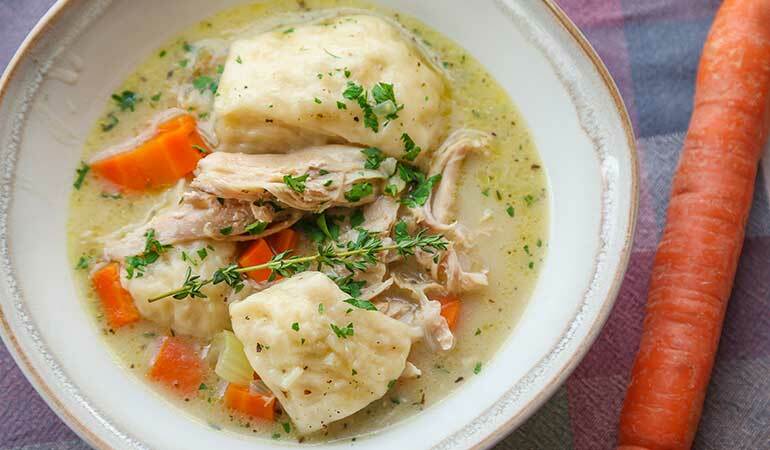 Chicken and dumplings is a favorite comfort food, and rabbit makes a great substitute. 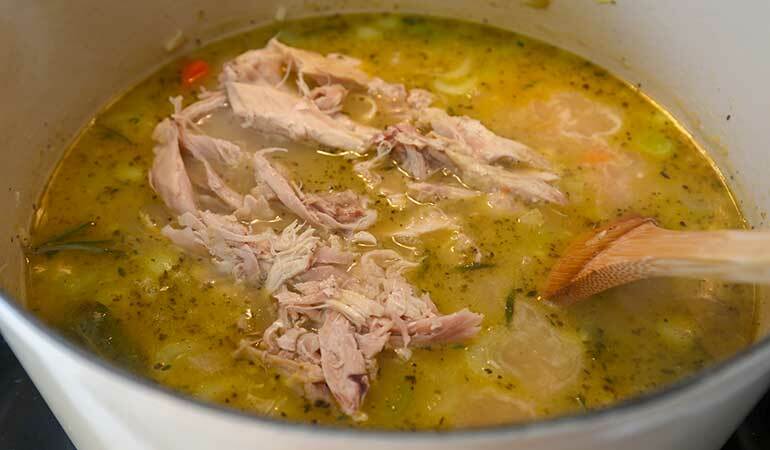 Light and lean, rabbit meat resembles chicken in many ways. This recipe was every bit as tasty as the original classic. If you have a favorite dumpling recipe, use it to your heart’s content. But to save some time, since this recipe does require making your own rabbit stock, I used Pillsbury Grands! biscuits instead and they worked perfectly. To make rabbit stock, heat 1 tablespoon of oil in a stock pot over medium heat. Add halved carrots, celery, onion and thyme. Brown onion on both sides, then add rabbit to the pot and submerge with water, about 8 cups. Bring to a low boil, then back down to a simmer and cover. Simmer for 1 hour. 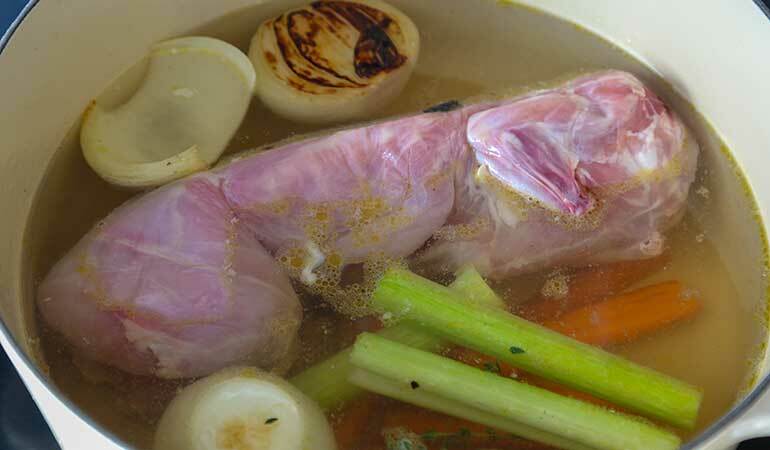 Remove rabbit from the pot and remove meat from the bones. Return the bones to the pot and simmer for an additional hour. Refrigerate the rabbit meat until ready to use. Strain the stock and discard solids. Keep stock warm. 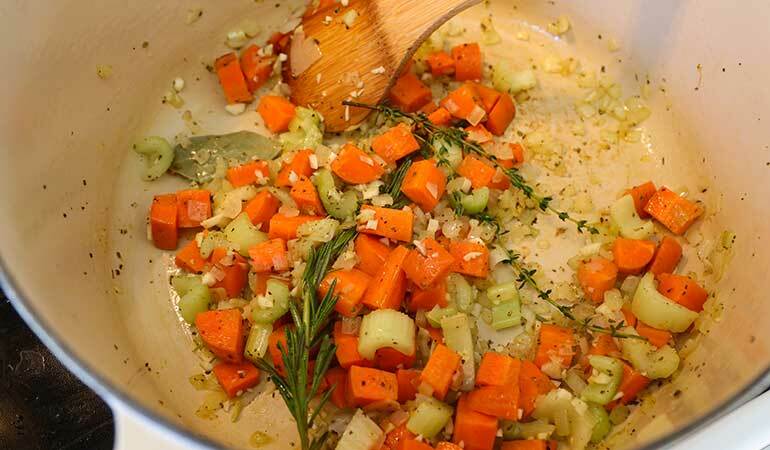 In a separate pot over medium heat, sweat chopped onion, celery, carrots, bay leaf, thyme, rosemary and sage in 1 tablespoon of oil until onion becomes translucent, about 5-7 minutes. Add garlic and sauté for 30 seconds. Add butter and flour, and cook for 2-3 minutes, stirring constantly. Add wine and let it simmer and reduce by half, scraping the bottom of the pan with a wooden spoon. Gradually stir in hot rabbit stock, stirring as you go. Bring to a simmer and add the rabbit meat to the pot. 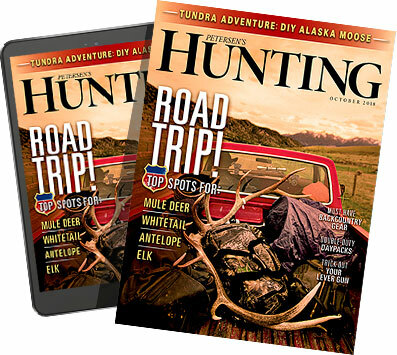 Season to taste with seasoned salt. Cut biscuits into quarters or halves. Drop each piece one-by-one into the simmering soup. 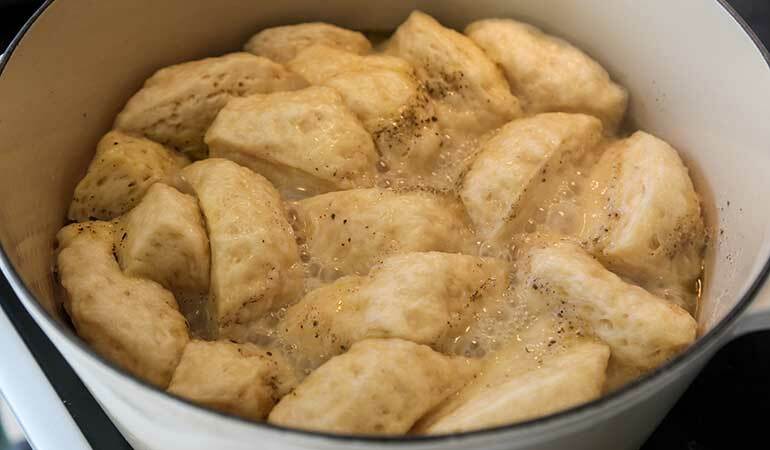 Cover and simmer for 25 minutes or until biscuits are cooked through; do not uncover the pot during this time to prevent steam from escaping. Stir in heavy cream and season again to taste with salt and pepper. Garnish rabbit soup and dumplings with parsley.